Engineers often turn to nature for inspiration, but working from evolutionary blueprints isn’t always necessary. The Defense Advanced Projects Agency (DARPA) recently showed off a dexterous robotic hand that uses three fingers, instead of a human-inspired four fingers and opposable thumb configuration. And the thing can unlock and open doors. Yikes. 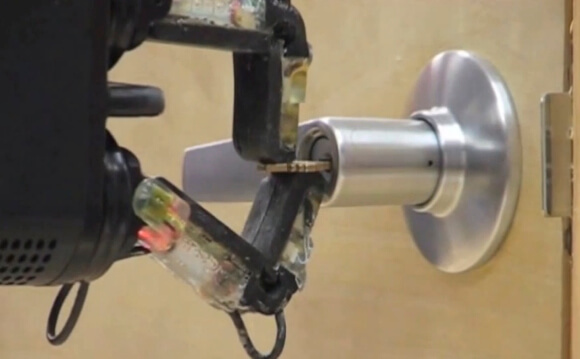 The hand, developed by iRobot with support from Harvard and Yale, is part of DARPA’s Autonomous Robotic Manipulation (ARM) program. ARM aims to move beyond “remote manipulation systems that are controlled directly by a human operator.” The goal is to build systems that are robust, dexterous, and low-cost. The DARPA hand uses Kinect to zero in on the object’s location before moving in to grab the item. It can pick up thin objects lying flat, like a laminated card or key. The hand’s three-finger configuration is versatile (can pick up a wide range of shapes, textures, and sizes), tough (used as a baseball tee), and strong (maintaining its grip on 50-pound weights). Although its Kinect sensor begins to incorporate some autonomous capability, the hand still requires an operator for manipulation of objects in its fingers. But the ARM project is divided into hardware and software. The displayed tech is in the former category, and presumably, the latter category is still being developed. The hand isn’t yet cheap by everyday standards, but the production cost has been dramatically reduced. Hands fabricated in batches of 1,000 or more can be produced for $3,000 per unit. According to DARPA, that’s an order of magnitude less than the current cost of $50,000 per unit for similar technology.